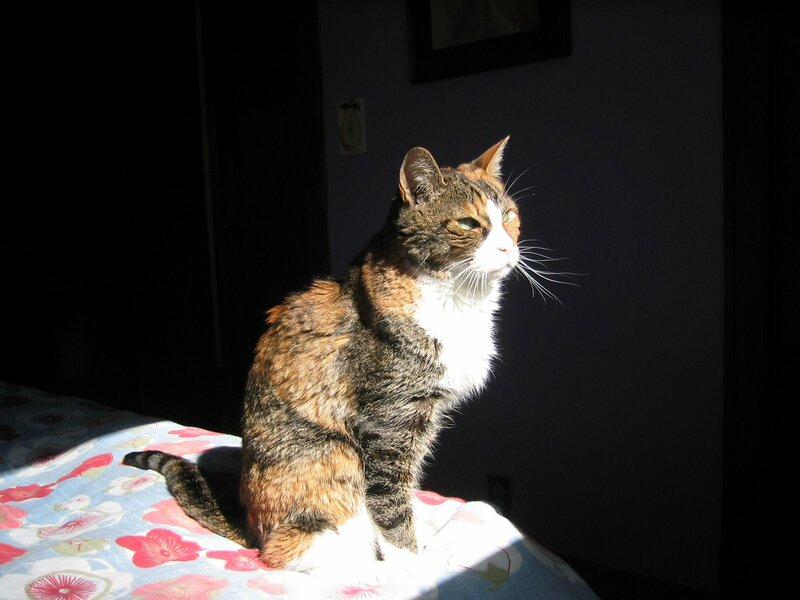 My husband and I had our dear seventeen-year-old cat, Houdini, put to sleep on the evening of August 8, 2007. For several years, she struggled valiantly with chronic renal failure. When she was fifteen, she came through a pretty scary crisis, when she was getting sick everywhere and ended up very dehydrated, flat on the floor. She wouldn’t purr when I petted her. (This became a litmus test for me–when she seemed under the weather, as long as she was purring, it wasn’t a true crisis.) I was in denial back then about losing her, but it made me realize that all the extra time we had with her was bonus. I believe her strong personality and crankiness were key to her long survival. While I said goodbye to her, scenes from her life flooded my memory…when she was spayed, because she was still so tiny, the plastic collar the vet had given her was too big, and protected her stitches but turned her into an unwitting physical comedy act. Instead I made a “sweater” by cutting arm and leg holes from a sock so that she’d leave her stitches alone. Every night she’d wriggle out of that sweater and in the morning I’d find her curled up, the sweater/sock a limp yin to Houdini’s yang. I recalled during her mid-years, trying to toilet train her–which sounded good in theory, but traumatized her pretty fully. All my apologizing paled next to how loudly she purred when I finally gave up and she saw I had set out a new litter box. (I could hear her purring from across my apartment.) I apologized again about the toilet training era before the vet put her to sleep. She sits and sits and sits and sits – and that’s what makes a Gumbie Cat! She had an opinion on and a solution for everything, usually involving salmon. After the burial, our neighbor’s dog Joe came down the hill, appropriately dressed in his black and white tuxedo-style fur coat, to pay his respects. Houdini Gatallini Bambini Baby-ini (her full name) aka “Noodle”, aka “Munchkin”, is survived by her loving human parents and her supersized 10 year old adoptive brother, Dante, aka “Big Tiny”. Dante’s eyes have been wider than usual since we showed him the body. The night after she died, he slept in the spot where she had slept the night before. I think he’s still looking for her. I saw something today in this photo of Houdini, taken several months before her death. The light and dark of loving and grieving, the complicated contrast between sadness and relief, the guilt I feel in letting her go. Her posture, defiant, beautiful, a true Gumbie cat with standards so high that I wonder if we ever met them. Sometimes, I think we came close. So friends, if you visit our house and it’s a bit more chaotic than usual, do not be shocked. It’s just that scrawny, cat-shaped void. This entry was posted in Uncategorized and tagged cat obituaries, Houdini. Bookmark the permalink. Thanks. :) I still keep thinking I hear her, or see shadows of her around the corner…probably will for a long time. I bet you will too. I can’t see how one could avoid it. I hope those ghost experiences are more poignant than painful. Is Dante coping any better? Oh, Rebecca, I’m so sorry to hear about your kitty. What a lovely tribute. I tried toilet training too, back when Waffle (now 14) was a youngster. Similar failure. I related to a lot of what you shared. . .take care. Thanks Jennifer. I still keep thinking I hear her, usually commenting on something she would have commented on in life… these little critters sure stick with us. Thankfully. Glad Waffle has been given the box back! I had a silky little Burmese for 17 years. She saw me through much. She loved me more than I deserved. Yes, they are dear. I doubt that I could be quite so fond of another cat, though I am fond of our two, even the one who leaves presents by the box. Ah yes, the presents. I had one very industrious cat when I was kid who loved leaving vole guts for us on the front walk to our house. (I had to use it in the novel, of course.) They do love us, despite our humanity, which is maybe the best part about good cats. Bless their little hearts! Brent, I’m sorry for your loss of your dear Aggie. These little sweet souls are so important in our lives. Thanks for stopping by, and may time help heal a little, as it sometimes will. Brent, I’m glad it helped. Thanks for stopping by. Just stopped by to remember Aggie, her Birthday is this month and was just thinking about her today, still miss her deeply but I know she’s better off now and hope she has found my Dad and rubbing on his legs as she always did. Happy birthday to Aggie! Houdini’s birthday was July 14, so the kitties are in good company. All the best to you and your family. I feel like Patric, thought I seen Aggie coming to the truck when I came home from work yesterday, cold chills and lost my breath for a moment, its a good memorie tho just wish it was really her. Brent, thanks for posting. Glad you have the good memories! Brent, wishing you comfort as you continue to grieve. All the best, and thanks for stopping by!